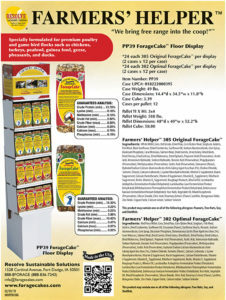 Farmers’ Helper™ Optimal ForageCake™ 13 oz. Red Proso Millet, Corn, Dried Peas, Corn Gluten Meal, Sorghum, Fish Meal, Gelatin, Dried Cranberries, Sunflower Oil, Cinnamon (Flavor), Sunflower Hearts, Peanuts, Sodium Aluminosilicate, Corn Syrup, Dicalcium Phosphate, Diatomaceous Earth (Flow Agent less than 2%), Cane Molasses, Salmon Meal, Propionic Acid (Preservative), Acetic Acid, Ammonium Hydroxide, Sodium Hydroxide, Benzoic Acid (Preservative), Propylparaben (Preservative), Methylparaben (Preservative), Sorbic Acid (Preservative), Hydrated Sodium Calcium Aluminosilicate (Anti-Caking Agent less than 2%), Choline Chloride, Turmeric (Flavor), Calcium Carbonate, L-Lysine Monohydrochloride, Vitamin E Supplement, Niacin Supplement, Calcium Pantothenate, Vitamin A Supplement, Vitamin B12 Supplement, Riboflavin Supplement, Biotin, Vitamin D3 Supplement, Roughage Products, Mineral Oil, Lactobacillus Acidophilus Fermentation Product Dehydrated, Lactobacillus Casei Fermentation Product Dehydrated, Bifidobacterium Thermophilum Fermentation Product Dehydrated, Enterococcus Faecium Fermentation Product Dehydrated, Rice Hulls, Vegetable Oil, Mixed Tocopherols (Preservative), Silicon Dioxide, Citric Acid, Rosemary Extract (Flavor), Lecithin, Manganous Oxide, Zinc Oxide, Copper Oxide, Calcium Iodate, Sodium Selenite. Allergen Statement: This product may contain one or all of the following allergens: Tree Nuts, Soy and Shellfish. Specially Formulated for Premium Poultry and Game Bird flocks such as Chickens, Turkeys, Peafowl, Guinea Fowl, Geese, Pheasants, and Ducks. 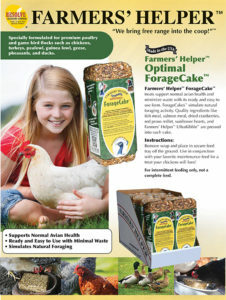 Farmers’ Helper™ ForageCake™ treats support normal avian health and minimize feed waste with its ready and easy to use form. 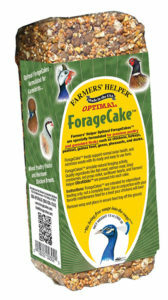 ForageCakes™ simulate natural foraging activity. Quality ingredients like fish meal, salmon meal, dried cranberries, red proso millet, sunflower hearts, and Farmers’ Helper™ UltraKibble™ are pressed into each cake. Remove wrap and place in secure feed tray off the ground. Use in conjunction with your favorite maintenance feed for a treat your chickens will love!